ranting frog: Sensor Aspect Ratios — What's Best? Sensor Aspect Ratios — What's Best? I was inspired by a question on the Photography StackExchange site to think about digital camera image sensors, specifically the aspect ratios commonly seen. Without getting into a long history of aspect ratios, I'll just say that far and away the most common aspect ratios for digital cameras are 3:2 and 4:3. There's various aspect ratios around these commonly used (TV 4:3, HDTV 16:9, Movies 1.85:1 or 2.4:1) as well as many variations in things like picture frames. Another common aspect-ratio is 1:1, though often for smaller things like profile pictures, and instagram photos. Suffice to say, whatever camera you have, there's a good chance you'll end up cropping images for different purposes (even if you don't do it explicitly, such as the automatic cropping when you print for a specific frame). And you'll probably find you use one or two aspects ratios more often than others (e.g. HD videographers will probably mostly want 16:9, many professional photographers like 3:2, social media junkies perhaps prefer square). So what is the best aspect ratio for a camera? Why don't they make native 16:9 cameras, given the prevalence of 16:9 video, or square sensors in phones mostly used for social media? Ok, so there are some that don't conform to the 3:2 or 4:3 standards. The Lytro actually has a square sensor, Canon are rumoured to be developing a square sensor, and OmniVision make some low resolution Native HD Sensors (16:9, 1-2MP). There's probably more, but its pretty uncommon, even in dedicated video cameras. I had assumed GoPro Hero 3+ Black cameras had 16:9 sensors because of their 4k video (4096x2160), but it looks like they're a ~4000x3000 sensor. So are square and wide sensors an untapped market? Or are they just gimmicks we don't need? The ideal case is going to be a circular image sensor. Well, sort of. The viewfinder would be weird. The RAW files would be weird. Framing would be awkward. You'd probably just set it to 4:3 or 3:2 anyway unless it was super easy to adjust on-the-fly. It's another thing to think about, etc... 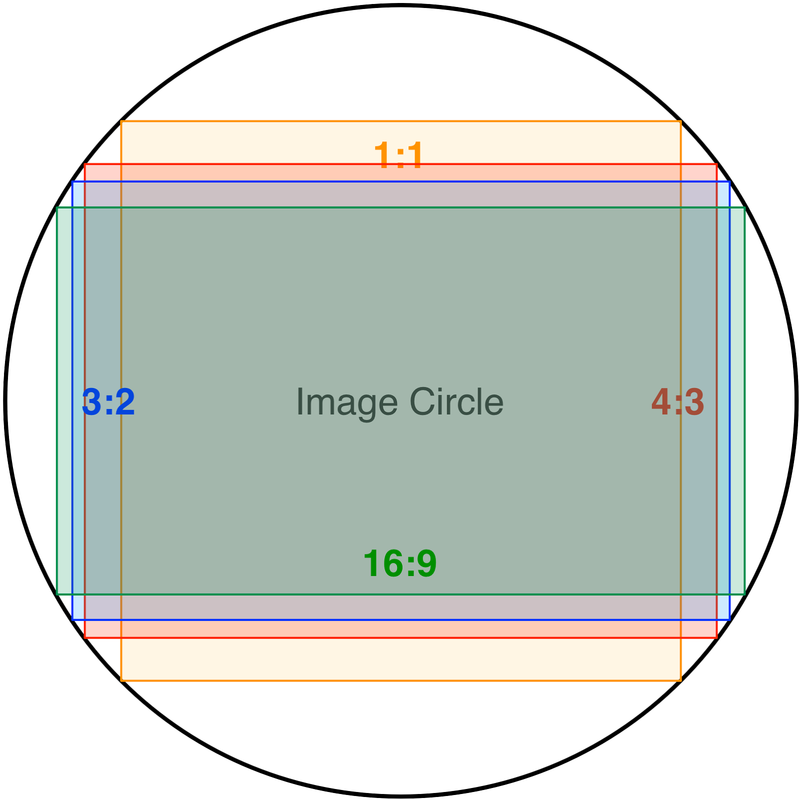 But mathematically, it does give you the most pixels on your image (assuming a given maximum pixel pitch) and give you the most coverage of the image circle (what with it being circular and all). 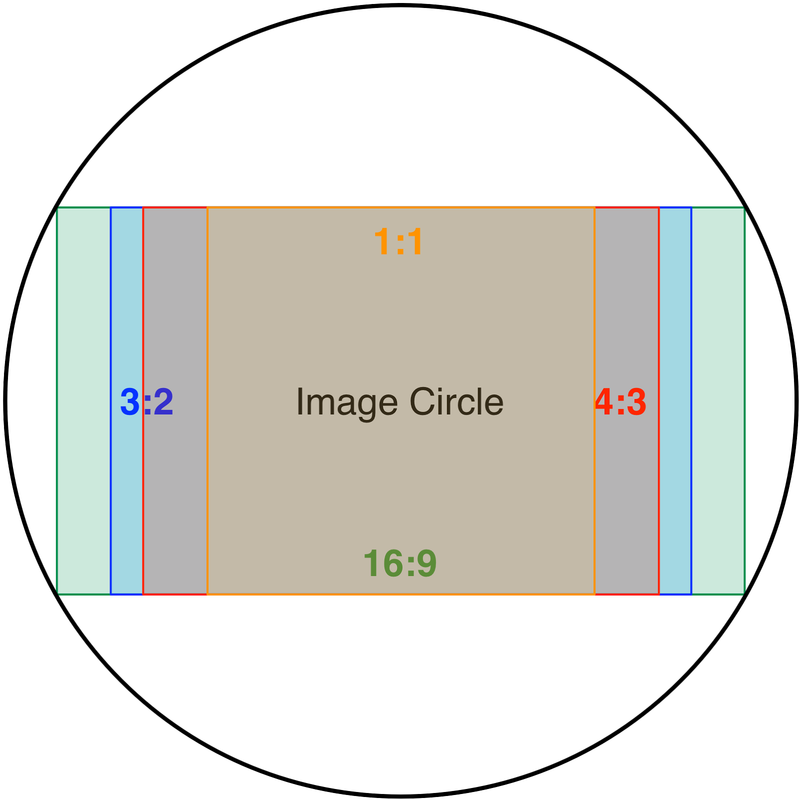 Some standard aspect ratios, at maximum size within the image circle. And here I've taken each of those standard crops, as if they were the image sensor, and applied various crops to show how much smaller they get. The point to notice is that the non-native crops start to get quite small, specially from the 1:1 or 16:9 sensors. Look especially at the 1:1 crop from the 16:9 sensor, and vice versa—both are considerably smaller than they could otherwise be. You can see the 4:3 and 3:2 sensors provide a bit more of a 'middle-ground', and are thus more flexible to be used with different aspect ratios. 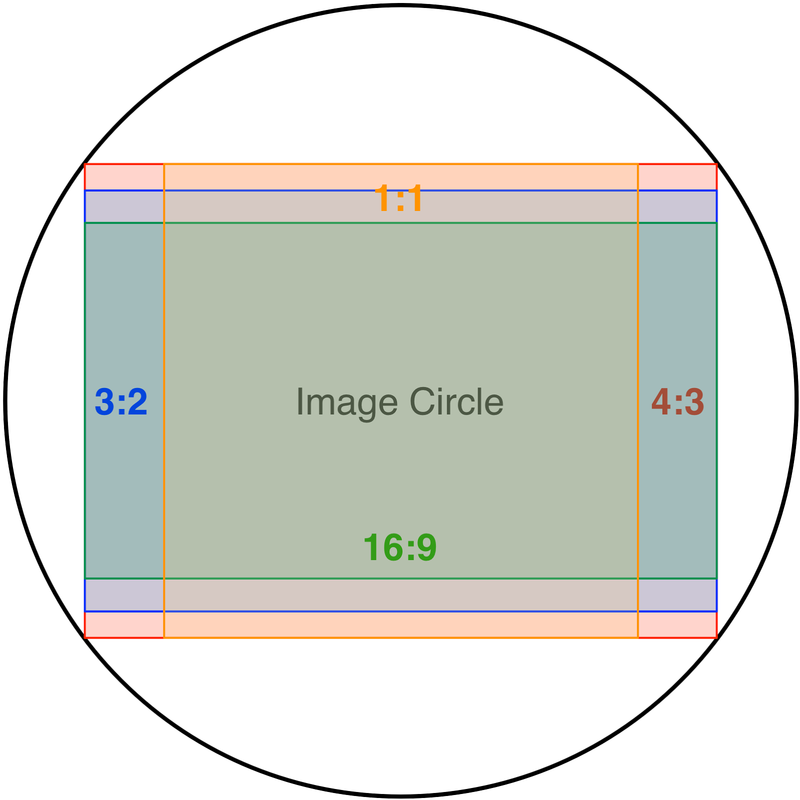 Below is a table showing the coverage of each crop of the image circle for comparison. The columns show what 'limits' the crop (i.e. which sensor is used) and the rows show what shape the crop is. 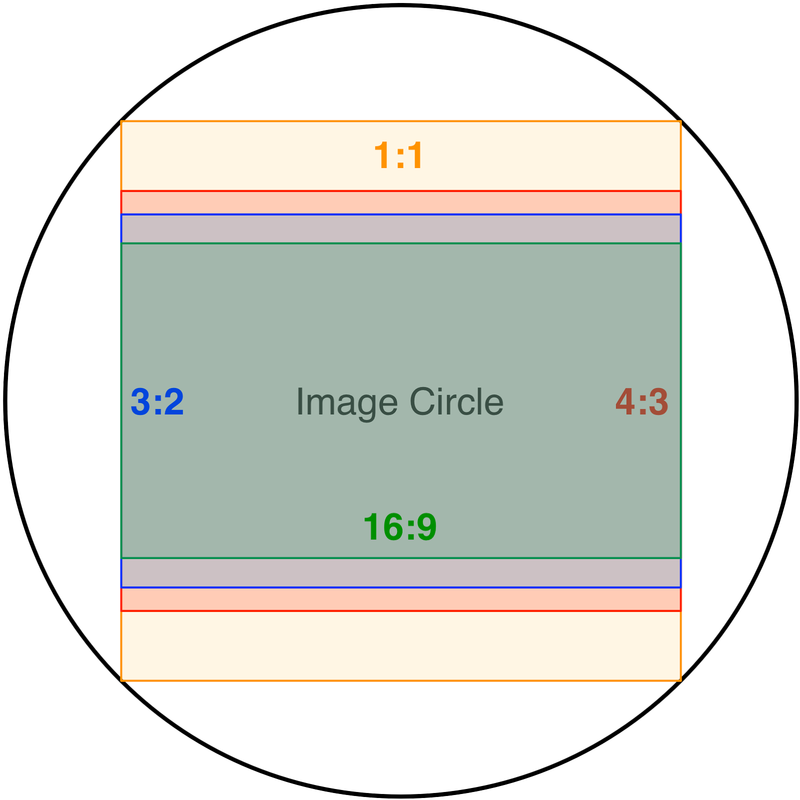 Higher values mean a larger area of the image circle is used, which is generally a good thing (more pixels, assuming a specific pixel pitch). 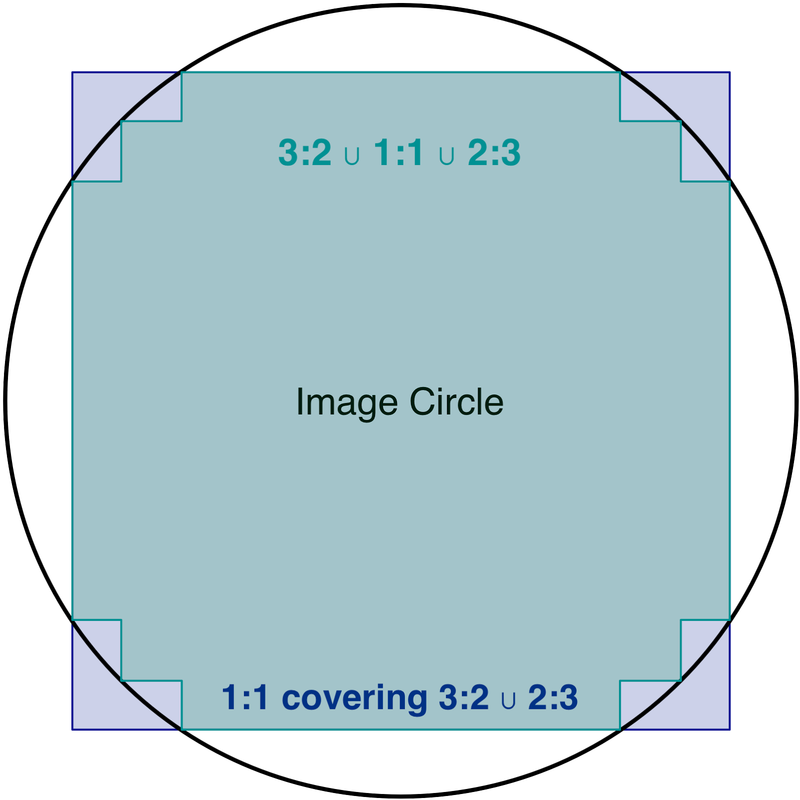 Coverage of the image circle for the various crops from the various sensors described above. The table shows much the same information, as the images, though perhaps a little easier to compare directly. 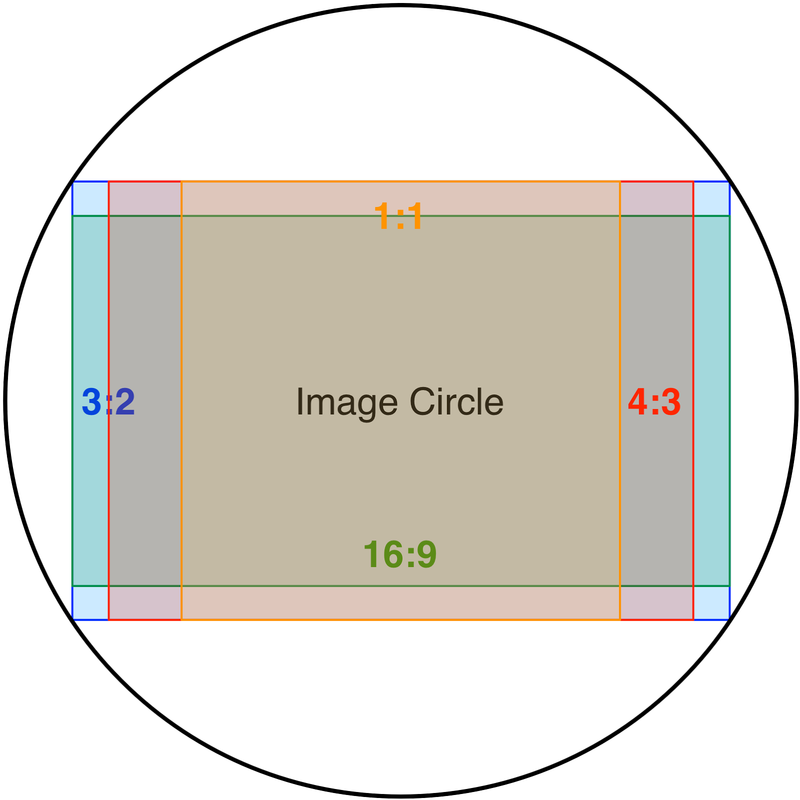 As you'd expect, the maximum coverage is achieved when only limited by the image circle (IC). In general, the 4:3 and 3:2 native aspect ratios provide the most 'general purpose' sensor, in that they provide reasonable coverage for both 1:1 and 16:9. Extra-large square sensor, covering square, and both portrait & landscape oriented 3:2-sized regions. Instead of using the 'inner' square, which immediately loses the edges of a 3:2 image in either orientation, a slightly larger sensor (or possibly even the kind-of-plus-shaped-sensor) means you keep full-sized 3:2 crops in both orientations, as well as an otherwise-impossibly-large square crop. Bigger sensors get significantly more expensive though, and require bigger mirrors, so this may well be out of the question. I'm even wondering if the rumoured square sensor is possible with the EF-mount lens-flange-distance. Anyway, I hope the table and graphs show why we're still using 4:3 and 3:2 sensors. Sure it'd be nice to have native 16:9 or 1:1 for those who only use one aspect ratio, but a 16:9 crop from a 3:2 sensor is only 8% smaller, while you lose 28% of the area for any of the squarer crops from a 16:9 frame (compared to cropping from 3:2). And, while you lose a lot cropping to 1:1 from any of these sensors, cropping to the common rectangular sizes from 1:1 cuts the image down by 28% compared to cropping from a 4:3 frame. For generic use: small gains, big losses. Besides, you likely get a much better quality mass-produced-3:2-sensor than you would a (slightly wider, but lower production) 16:9-sensor anyway. I was wondering about the same thing but in the end it is hard to tell the aspect ratios of the history. Only person which has been concern with the history can get the exact figures. As far as I am concern about the ratio than it has been higher from the one that I have been expecting. You are having so many things that needed to be described with detail. Photography is not an easy job it require so many hard work and full attention, so many people take this as their profession. If you want to learn it then you have to read this given website https://eliteassignmenthelp.com/do-my-assignments and read article carefully, you will learn so many new things. I am providing Assignment Help Australia service to students. If you're suffering from a compelling sense of generosity after reading something helpful on here, feel free to buy me a beer!